One way to define a Sine Wave is as a mathematical curve that describes a smooth repetitive oscillation. Any sine wave is repetitive in nature. After any fixed time period, also called a cycle, it repeats itself. In the sine wave pattern every cycle is identical. Another important aspect is its oscillatory nature. 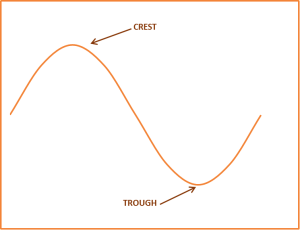 In any cycle, the sine wave will have its periods of crests and troughs. The crests will be exactly symmetrical to the troughs, but in opposite direction. A typical sine wave over one cycle, with crest and trough marked, is shown in the Figure 1 below. AC current, by virtue of its nature, depicts a perfect sine wave. 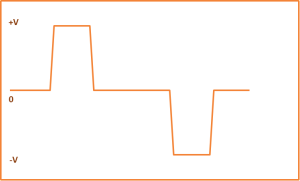 The AC current waveform shows similar repetitive oscillation between a positive and a negative value of Voltage. As, we are familiar, the electricity produced by a solar panel is DC in nature, while most of the household loads require AC power. What is the difference between True Sine Wave and Modified Sine Wave? Tue sine wave depicts the waveform shown in Figure 1. It is an exact sine wave. There may be some distortion at the crests and troughs, but that is insignificant. Modified sine wave, on the other hand, is a distorted version of a true sine wave. It still is a sine wave as it is repetitive and oscillatory in nature. It produces instantaneous peak voltage for a few milliseconds and then goes down to zero for a few milliseconds. This pattern, as shown in Figure 2 is repetitive in nature. There is certain equipment that runs well on modified sine wave current, such as a digital clock. However most other equipment requires a true sine wave. One important thing to remember is that it is extremely easy to convert True Sine Wave to Modified Sine Wave, by clipping off certain parts. The reverse is extremely difficult. Biggest advantage of Modified Sine Wave inverters is their low cost compared to True Sine Wave inverters. Also, for simpler induction loads, like a motor, or a resistive load, such a light bulb, the Modified Sine Wave utilizes DC current more efficiently. For simpler household needs, Modified Sine Wave offers high efficiency at a lower cost. When it comes to complex loads, a True Sine Wave is best suited. Nowadays mainly Chinese manufacturers have started to manufacture True Sine Wave for competitive prices, and cost nearly the same as Modified Sine Wave inverters. If you’re not completely sure which inverter to choose, or if you’re not clear on which households you’ll connect in the future, go with the True Sine Wave inverters. The slightly higher price of True Sine Wave inverters can easily be offset by the longer life of your sensitive electronic equipments.